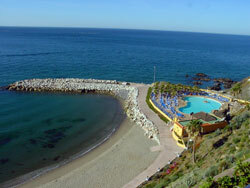 Benalmadena is situated 22 km west from Malaga, has an extensive marina and plenty of hotels and apartments for rent. There are three different areas of Benalmadena, two older parts of the village, Benalmadena Pueblo and Arroyo de la Miel and Benalmadena Costa, at the seashore. The older part maintains the typical andalusian architecture, at the same time as you can find a wide range of entertainment through several attraction parks, such as the Tivoli World or the Selwo submarine park or the Casino Torrequebrada. In Benalmadena village, a little bit further up the hills, there is an magnificent Enlightenment Stupa (a monument that represents peace, prosperity and harmony in Buddhist culture, as well as being a place for meditation), being the largest Stupa in Europe. Close by the Stupa recently opened a butterfly museum.